The 5.2-liter V-10 traces its history further back, but for now, just practice this special edition’s spelling. One of the best things about being alive right now, as a car lover, is the Audi engine plant in Hungary. Nestled between Budapest and Vienna are 6000 exacting pairs of hands that assemble more than 8800 engines per day and ship them to all 31 of the Volkswagen Group’s final assembly plants across the world. 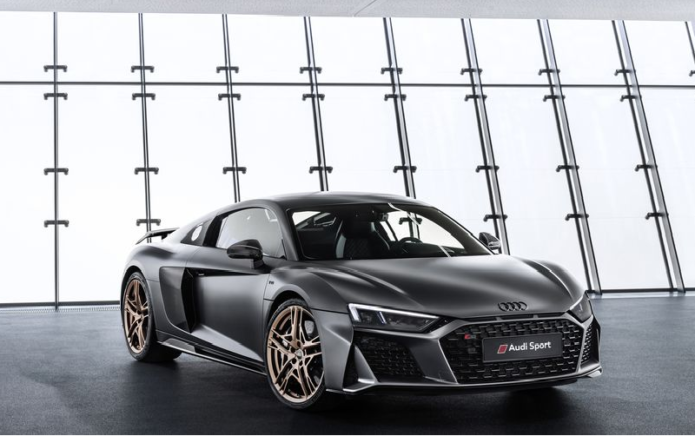 Of the nearly two million engines this plant cranks out each year, a small drip of 5.2-liter V-10s—naturally aspirated, race proven, loud as hell—find their way to Neckarsulm, Germany, where more careful hands drop them into the Audi R8. It’s been like this for a decade. Or, in Audi’s studious Latin, a decennium.